Ancient Egyptian"Ne Kingdom Pharaoh & Coffin Panal"
The above listed item is from the New Kingdom Period,(1293-1075B.C.E. ),19th to 20th Dynasties, as a guideline. 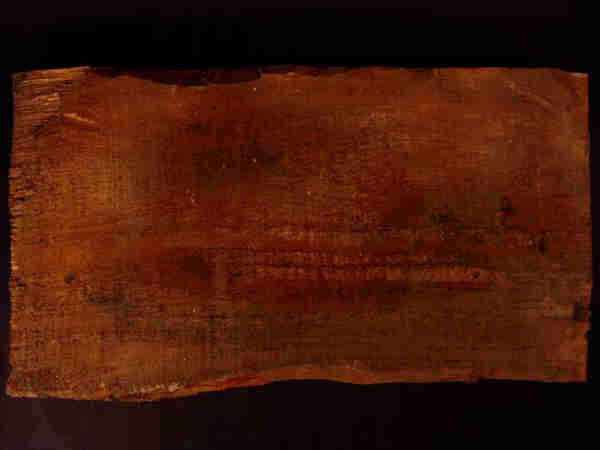 This incredible and extremely rare "Wooden Coffin Panel" was gesso covered and then detailed with paints. We acquired this exquisite item from a select private collection and its provenance is from Alexandria, Egypt. 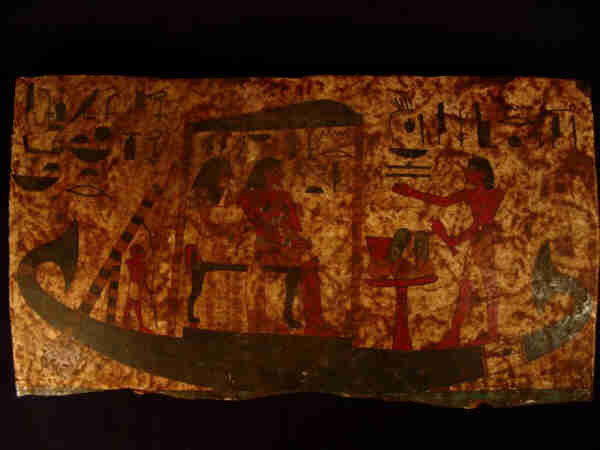 Depicted on this painted scene of a lotus style, Royal Nile Barge is a helmsman at the stern, holding a draw pole with long oar at the side. At the center of the vessel, under a detailed framed canopy, is a throne seated Pharaoh and Queen. They are elaboratley shown in detail, true in form and dress, to their respective royal status. In front of them is a prince or noble wearing a wig holding a vessel and making offerings in veneration to these two seated rulers. The bow of the boat has a lovely Eye of Horus. This entire nested coffin panel is completely covered with period style hieroglyphics! This wonderful sectional piece is intact, has retained much of its black, green and red colors and it has areas of age wear. The reason for the item being available is due to the vast extent of archeological findings, thousands of years in Egyptian burials and also the proliferation of these said items in older private collections worldwide. Material: Wood, Gesso and Paint. Dimesions: Height:23.9cm Width:41.8cm Depth:1.8cm. (1 inch = 2.5 cm). We always do our best to make all of your transactions easy and comfortable. Our ideal is to offer our customers every opportunity to acquire an Egyptian anitquity without the high end gallery price tag. Know that we stand firmly behind all of our fine products, guarantee and easy return policies. You have nothing to lose so, Bid with the Utmost Confindence! ".